As Middlesbrough fell 3-0 to Chelsea last weekend, Guzan was the focus of fans' displeasure. All three goals game from shots that went between Guzan's legs and while it's not the most ideal way to concede a goal, it's also not the easiest shot to save. All three shots came within five yards (see above pictures) and from England's premier team. Moving a foot to cover the five hole runs counter to the typical motion of moving forward or setting feet wider. Guzan should have stopped at least one of those - specifically the second one - but the save isn't as easy as it looks. For Atlanta United fans who may worry about Guzan's performance, take solace that Guzan is getting bested by England's top club, not DC United or another MLS team. Having Diego Costa slip one past Guzan's five hole just doesn't have a comparison for MLS and he should transition fine in MLS. Guzan may not be the elite goalkeeper that some want him to be, but he's also not the bottom rung. Despite the 3-1 win, Ethan Horvath conceded probably his worst goal in his professional career. As a through ball outran its target and ended up in an easy collection for Horvath, he immediately set the ball on the ground and looked to play out from the ground. To Horvath's surprise, a striker stole the ball and shot on the open goal. Horvath pleaded with the ref after mistaking a whistle from the crowd but the goal stood. Brugge fans were immediately supportive of Horvath over the gaffe, knowing his ceiling is much higher than what they saw last weekend. Horvath's error is from misunderstanding the environment, not poor technique, and doesn't call for worry. Horvath is set up to be the club's number one next year and rightfully has already put the mistake behind him. In the 28th minute, a Sporting Kansas City defender turned the ball over thirty yards from goal. As Red Bulls' forward Fredrik Gulbrandsen took a large touch towards goal, Melia stayed back to prepare himself for the ensuing shot. Confident in his ability, Melia didn't feel the need to carelessly rush out there. We've seen a goalkeeper sprint out for the tackle only to be lobbed or chipped for a goal a hundred times. Melia recognizes he has a defender sliding in and that there's a good chance the shot won't even land on frame. It's still a fantastic shot from Gulbrandsen, especially considering the limited time and space to put an attempt on goal, but Melia has prepared himself to cover what he can. This results in an even better save from Melia, in large part due to his confidence to handle whatever's thrown at him. It's an easy fix for Harris to avoid the situation. If she uses her right hand to push the bar over the crossbar, her defense can calmly set up for the corner kick. Despite the misplay, her concentration on the rebound is astounding. Even as she is tumbling into the side netting, Harris keeps an eye on the ball (second picture). The concentration is a great example of reacting to poor situation and not giving up when things look grim. In an article with ESPN, Kasey Keller was critical of goalkeeper development in the US last month. 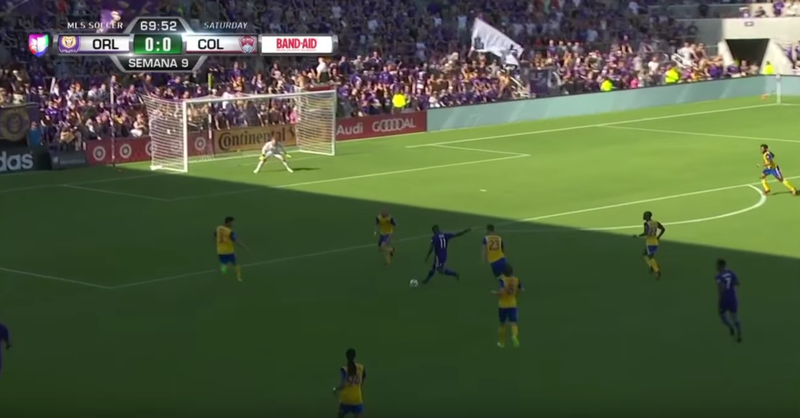 In an attempt to corral a lose ball, Shuttleworth took a kick to the face from Dom Dwyer. The result was a swollen nose twice its normal size. For a new team that needs all the stability it can take right now, Shuttleworth fought through the pain to keep his team - and shutout hopes - alive. If Shuttleworth had called for a substitute, it would have been completely understandable. Instead Shuttleworth fought through the pain and it's going to be something the team remembers for the rest of his career. While some may not be thrilled with American goalkeepers' ability to push through tough situations, it clearly doesn't apply to Bobby Shuttleworth. Eight? That's right! Last week was so jammed pack with goalkeeping highlights (and lowlights) that we needed more space to cover it all. So let's get to it! Once again MacMath attempts the overhand save to no success. His footwork complicates the issue with a needlessly wide stance that limits any lateral movement, but the hand motion is a returning issue. Like we addressed last week, some believe the overhand save can do nothing better than diving with the nearest hand can. There's definitely a valid point to the claim. Perhaps the better way to phrase is that a goalkeeper needs to find what works for him or her. If the overhand save isn't working, the goalkeeper can't expect it to just magically fix itself. For some, diving with the nearest hand might be a stronger option. Personally, the overhand save is so similar to the over-the-crossbar tip (when a goalkeeper has been chipped and is racing back to the goal line) that it's easy to translate the two. Also I feel it gets better leverage to displace the ball but regardless, the answer for any goalkeeper is finding what works best for them. MacMath needs to revamp his strategy, which may result in a small tweak in technique or a completely different approach. 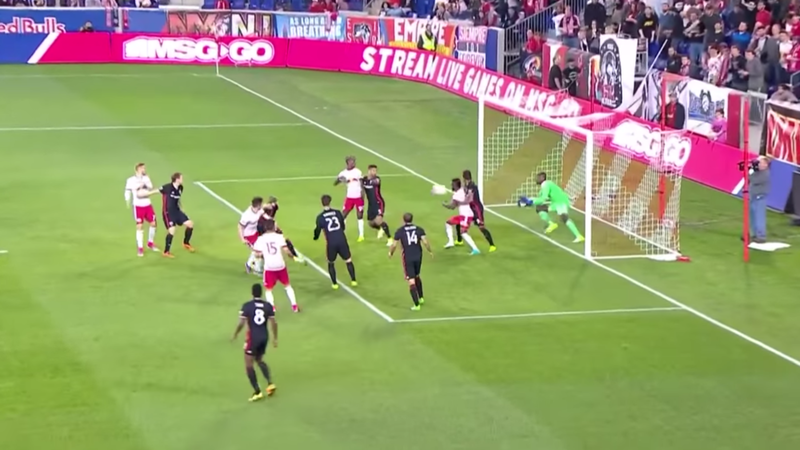 For anyone who was watching the Eastern Conference match up on Sunday, who wasn't ogling over Hamid's two early saves? It really felt like Hamid was hinting at a return to form until the following goal. 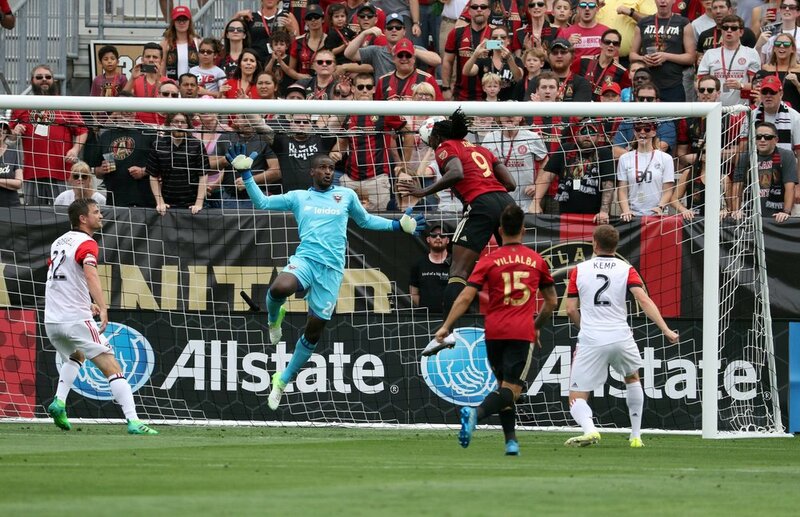 Hamid seems to have tweaked his groin on the second save, right before conceding Atlanta's lone goal for the afternoon. While there could be an argument for Hamid not being at 100% to make the save, the bigger problem is his approach. Yes, it's an unfortunate play but Hamid severely limits his chance of saving a shot (one that isn't too far from his body) by throwing his body in the air. Perhaps if Hamid was closer to the shot and the time to react was removed, the starfish would make more sense. But here, he can stay grounded. Doing so keeps the same surface area with his body shape, but with the added bonus of mobility to react to the shot, essentially doubling his size. The game was a classic display of great-save-poor-conceded-goal. It's not a secret the USMNT needs more consistency, not chaos, in the back. If Hamid is truly wanting to make a run at the USMNT goalkeeper position, he needs to find that consistency to save what's in his reach and occasionally pull out the great save. In the 58th minute, Attinella parries a rocket from just past the penalty spot. As the ball travels back down to a well-placed FC Dallas player, Attinella displays textbook skills on getting back to his feet. Notice how even and well-timed Attinella feet are when he plants. Both feet hit the ground at the same time and he can move either direction with ease. He's not awkwardly stepping into it or guessing which way the shot is going to go. It's a simple movement, but a much overlooked fundamental to goalkeeping and one that doesn't happen in MLS enough. After Orlando's 3-1 loss to North Carolina this weekend, Ashlyn Harris wasn't slow to say that her teammates needed to perform at a higher level. I don't think anyone can disagree with Harris' main point: a 3-1 loss is not acceptable and players need to perform better. (Highlights here) You want to create an environment that has room for criticism so the team as a whole can step up their game. However Harris' own performance in the match left something to be desired, giving up a soft rebound on the first goal and misplacing a pass that directly led to the third. At the end of the day, North Carolina still outshot Orlando (13-5, shots on goal) so the scoreline is warranted. But if Harris is going to start saying individual performances aren't good enough, she needs to own up to her own shortcomings. 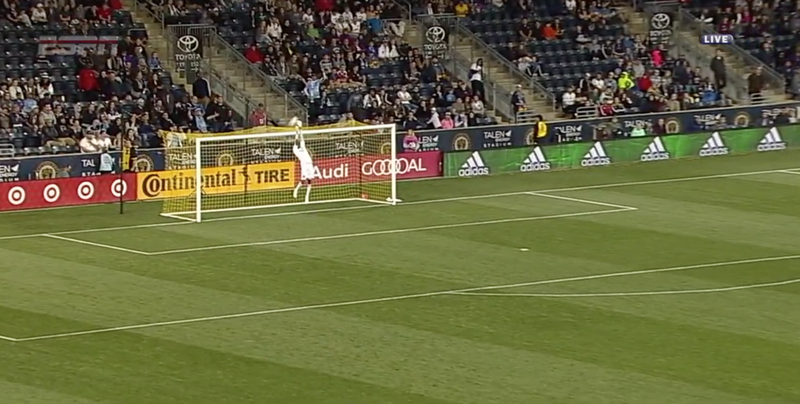 Frei conceded probably his worst goal in his MLS career last weekend. In the 15th minute, Lee Nguyen strikes a knuckling shot from outside the box. The shot tails to Frei's right at the last second and slips in for the first goal of the game. It felt eerily similar to Dempsey's goal against England in the 2010 World Cup. You can watch the highlights from the game here, although there's not a great picture to pull from it. As the ball dips towards Frei, he places his right knee into the ground. (This isn't a proper long barrier, for the record. The long barrier twists the hips and, in this case, would place Frei's right leg perpendicular to the oncoming shot.) The goal is another great example of the dangers with dropping a knee on a low-flying shot. If anything goes beyond expectation, the goalkeeper is stuck. The shot looks predictable until the last second, when it slides away from Frei. If Frei utilizes the front smother, he can shift his body weight, shoulders, and hands to cover the shot. Some may argue that Frei just didn't do it right and if a goalkeeper drops his or her knee correctly, then it's not an issue. Personally, the technique is too hard to execute consistently without the occasional error, especially for skipping or knuckling shots. There are too many variables that can happen on a play, as displayed with Frei's mishap. The front smother attacks the ball, limiting the ball's movement, yet still gives lateral movement to help deal with a late bend or skip from the ball. The three goalkeepers leading the pack to take over the USWNT goalkeeper spot are Jane Campbell (Houston), Haley Kopmeyer (Seattle), and Adrianna Franch (Portland). We talked a little about Campbell last week and with this week's games, the other two have given us talking points. While there are a number of positives to talk about Kopmeyer's and Franch's abilities, the two struggled in situations they'll encounter again sooner than later. First, Kopmeyer and Seattle fell 3-0 to Boston, conceding all three goals from 1v1 situations. As we witnessed with the SheBelieves Cup this spring, the USWNT goalkeeper is likely to see more 1v1s with the 3-5-2, so they're fairly relevant for American goalkeepers. Kopmeyer isn't responsible for all the goals but there were some odd movements on the plays. On the first two, her body movement is a little off - it looks like she trips on the second one - and on the third she tries to kick save a shot heading to the top corner. For a goalkeeper who has shown tremendous strides over the last three years, her 1v1 game still needs some work. In Portland, Franch held a 1-0 shutout, but not without giving away chances for potential goals. In the 22nd minute, she completely tackles Christen Press on an incoming cross. It's hard to tell if Franch gets a touch on the ball or not, which makes Franch's decision all the more risky. I think her right hand barely clips the ball, but if it doesn't this is an easy penalty call. The risk/reward for Franch here isn't worth it and there's a way to close down the angle without having to tackle Press, or at least minimize contact. Later in the 62nd minute she spills as simple collapse save, opening up another chance for Press to bag a goal. Added to the poor distribution from earlier in the season, she has her own parts of her game she needs to finish polishing. It's not time to panic as all three goalkeepers have shown bright spots, but it's also not time to move on from Naeher and Harris any time soon. Going back to the battle of the Uniteds, Kann had a terrible span of five minutes that led up to the second goal. First, a corner in the 36th minute led to a vertically skied ball that was coming back down in the box. Kann awkwardly walked out to basket catch the plummeting ball but dropped it in a crowd of players. Fortunately Kann was protected with a soft foul call but the free kick from Kann went straight out of bounds. The ensuing throw-in went straight to Acosta who ended up taking a mild shot from twenty yards out for the second goal. (Watch here, at 2:21) If Kann handles the corner like he should, collecting the ball clean and helping his team in transition, he removes the following errors and it's still a 1-1 game. Not a whole lot I can add here so I'll just present Van Oekel's header without comment. Jane Campbell is the only USWNT goalkeeper with a cap who is also younger than 29. Despite this, there were more than a few upset about the decision, as documented by a fine write-up from Backline Soccer. For a league that's supposed to develop American players for the national scene, it's odd that some don't wish to see such a highly rated prospect receive time on the field. Some of the complaints were directed at Campbell not being ready for NWSL. Aside from any prospect needing playing time to develop, Campbell's errors are routinely seen in both NWSL and MLS. Hope Solo was suspect on aerial service and every weekend we see a goal off an easy rebound. Even Kopmeyer's lone conceded goal is a result of a poor punch out on a ball that needs to go to the corner flag, not the center of the box. Houston has several problems greater than Campbell's performance last weekend. Looking back on the game, it's clear Campbell has talent but she needs game time to get to the next level. Benching Lydia Williams (Australian national team goalkeeper) isn't ideal, but the Dash didn't draft Campbell to sit on the bench. If the USWNT can't find game time for their early-to-mid-20 year olds, they may find themselves in a similar position as the USMNT down the line. Watch the play here, starting at 2:12. Campbell isn't the only goalkeeper met with polarizing views. Zac MacMath has received his fair share from the public as he's filled in for a suspended Tim Howard. Last week MacMath held his own by making two important saves earlier in the match before finally conceding in the 81st minute. The goal came off a rebound from the post that originated from a shot atop the box, to MacMath's right. As MacMath covers the goalmouth, he utilizes the overhand technique to make the save. It's not clear from the video, but I don't think he actually deflects the ball. If he did, the impact looks fairly minimal as the ball still rockets off the post with some power to it. There is some debate on the usefulness to the overhand save. Some claim that there is nothing the overhand save can do that the underhand save can't while others prefer the overhand save whenever possible. Either way, we can all agree the overhand save needs to go with the momentum of the ball if at all possible. Notice how MacMath's right hand approached the ball from underneath. 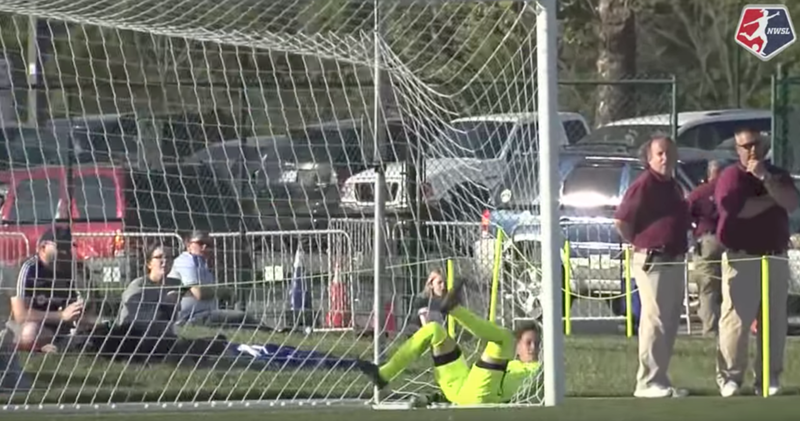 There are two reasons a goalkeeper should avoid this. First, it blocks the goalkeeper's view, as shown in the second and third frame. For such a tight play, the goalkeeper needs to know exactly where the ball is or else he risks missing it entirely, which is possibly what MacMath does. Secondly, going with the momentum makes it easier to line up the hand to the ball. For baseball players, think of a batter's swing. The batter wants to get his bat behind the ball first and then make his adjustment with his wrists or arms if need be. MacMath goes from underneath as misreads the ball because of it. One of the more disappointing plays for goalkeepers to make is conceding a needless goal in the final minutes to ruin a shutout. After 87 minutes of absolutely dismantling Chicago, Toronto is caught on a counter despite leading 3-0. The through ball is originally played to Bono's left (before the picture, above) but with defenders in the area, Bono correctly stays at home. Unfortunately Bono has cut so much of the angle off, he is in no position to cover the ball on the slotted pass back. For a young goalkeeper, finding consistency and style is incredibly important. There are aspects of the game where the goalkeeper gets to decide if they will play certain situations aggressively or passively. However, Bono's approach on the goal is somewhat like getting caught in no man's land. He has needlessly stepped forward to cut down maybe an inch of the goal frame but has also given up the entire backside. If Bono take a step or two back, he may be in reach of the eventual shot. 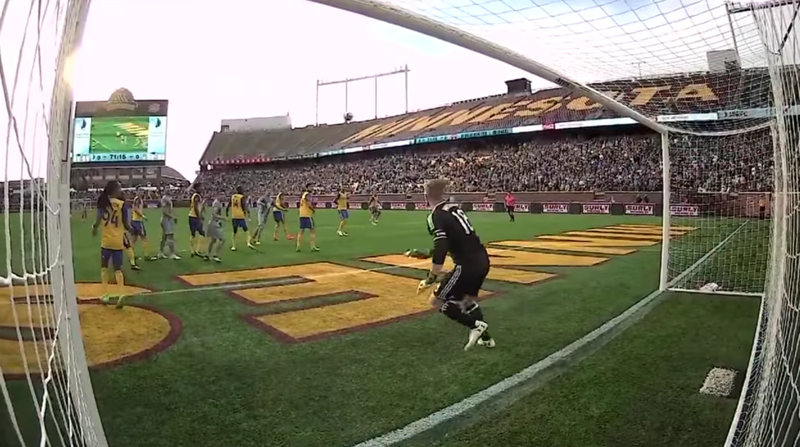 This is a much tougher play than it looks and one that most MLS goalkeepers will opt out of. For starters, Attinella displays some intriguing footwork. Notice how Attinella's shoulders turn on the play. Originally his right foot is cheating towards the back post but as the striker approaches the end line, Attinella squares him up. In doing so, Attinella is now giving first priority to the cross. With a simple hop, Attinella can attack the cross and eliminate a potential shot, instead of having to spin back to stand on the line. There's always a bit of danger on these sort of plays. Attinella is fortunate not to have any collision here but he also correctly protects his head with his right arm to avoid possible contact there. For a goalkeeper who hasn't received a ton of playing time, it's a fantastic veteran play with minute details than often goes unnoticed. Not a whole lot to say here outside of Robles giving Filipe props on the creative slide. I'm not sure if this was planned or not but at least we know Robles is paying attention to any extracircular activity around his wall. Not a whole lot to add here. You may notice Melia gets pulled to the right from the movement of the ball. You'll see a lot of goalkeepers not be able to recover back to their left on this play but Melia is light enough on his feet to make the fantastic save. Melia is the best goalkeeper in MLS right now and it's not even close. In the 90th minute, Philadelphia is still searching for their first goal as they trail NYC 1-0. A corner gets cleared to Philadelphia's Jack Elliott, who makes a meal of a clearance and gifts a midfield "shot" for David Villa. I don't think Andre Blake is in a bad position (looks like he's still in the 18 on a play his defender should be taking care of) but his approach is problematic. Blake traces the looping ball like a centerfielder tracking down a fly. The crossover step (in this case, right foot repeatedly crossing over left) is the correct movement. It's quick and helps Blake implement his overhand tip. At the last second, Blake turns his back to the goal to try to jump straight up for the "shot". There's not a lot of time left in the game so Blake is probably trying to keep the ball in play so there's some reasoning behind Blake's last second turn. However, Blake needs to cover the goal to keep the ball in play. Jumping high (see third picture) is nice but it doesn't cover the crossbar for a ball coming down at such an angle. If Blake stays with his crossover movement he can save the goal and possibly keep the ball in play, depending how he turns his hand. There's not much difference between a 1-0 loss and a 2-0 loss, but this is yet another example of a hole in Blake's game. Crossing and aerial attacks have been problematic for Blake in the past and even though some are praising Villa for the "shot", it's a result of Blake's play, not Villa's. Orlando scored the winning goal in the 90th minute but as always time remains for one more chance. A poor turnover just outside the goalmouth leads to a scramble in front of net. Bendik corrals the loose ball and has a word with Alessandrini after challenging Bendik for the ball. 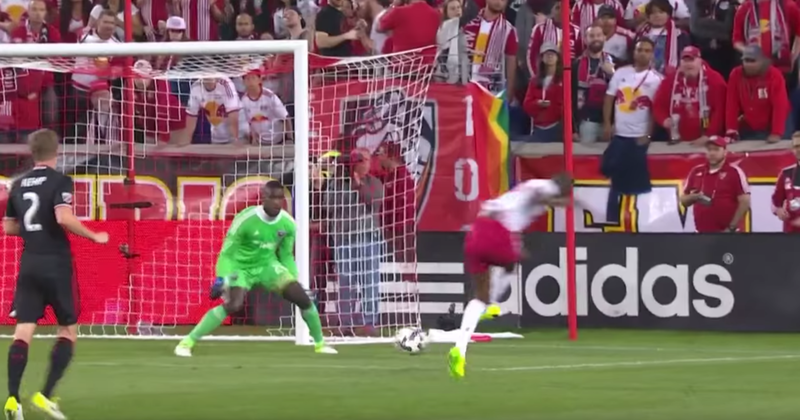 The two goals against the New York Red Bulls are hard to explain. (Both goals are pictured in the slideshow above.) The biggest complaint I have on the first goal is not the fact that he missed the floating ball, or that he was well behind the goal line on the play, but that he immediately complains to the ref for not calling a foul. When you give up a soft goal, don't look to the ref to pass the blame. Own it, move on, and get your team rolling again. The second goal is something I've been critical of Tim Howard in the past. The wide stance on tight situations opens up the five hole for shooters. Perhaps MLS attackers don't exploit it as much as they should, but on the international scene, these mistakes get punished more often. It's been a rough start for Hamid in 2017. He's been playing so poorly this year you have to wonder if he's still distracted with a nagging injury, which he may be. The idea that "goalkeepers make mistakes sometimes" doesn't exist on the international scene. If that's the excuse you're going to give, someone else is going to step up and take your place. While Hamid needs to regain his stride, he may also want to take a hard look at his approach to specific situations. One of the highlights of watching a young goalkeeper play is when they finally takeover the reins of a team. Until then, a team is cautious to protect their goalkeeper. It displays itself in small glimpses. A defense may not push as high because they're worried about their goalkeeper. Strikers may keep a higher line when defending corner kicks because they know their veteran goalkeeper is going to handle the chaos in the box. Goalkeepers can either empower a team or be protected by a team, and plays like Gonzalez's lazy hand swat is a great example of how teams know if a goalkeeper still has room to grow. Nothing comes from the miscue, but FC Dallas defenders are well aware of Gonzalez's limitations due to plays like these. Nearing the end of a miserable day for the New England Revolution, a sloppy back pass comes Cropper's way in the 86th minute. It's not ideal, but Cropper has the time to either switch the ball to his left or just send it back up field to his right. Instead, Cropper struggles with hitting the ball forward in either of his two attempts. Bad passes happen, sometimes in pairs, but an interesting exchange occurs when Cropper yells up the field for the poor pass. Defender Antonio Mlinar Delamea (number 19) screams back at Cropper, showing him how wide open he was. Similar to Hamid's situation, Cropper doesn't need to put the blame on his defender for his own performance. If there's a miscue, Cropper must find a way to empower his team to move forward and not feel like they have to overprotect him.